Hungary’s ruling Fidesz party had, by any standards, a terrible last month or so, yet new polling figures suggest that the popularity of Prime Minister Viktor Orbán’s government did not suffer at all. It was revealed that Ghaith Pharaon, a Saudi businessman wanted by the FBI and Interpol for wire fraud, racketeering and allegedly funding terrorists, conducted business with a company tied to Prime Minister Orbán’s son-in-law and bought a house in Hungary, across the street from the prime minister’s Budapest residence. It also appears that Hungary’s Ministry of Foreign Affairs and Trade conducted business with a company tied to Mr. Pharaon, up until this fall, when it terminated the contract. When a Socialist MP asked Mr. Orbán about his connection to the shady Saudi businessman, the prime minister confirmed that he had attended a dinner with “Professor Pharaon” at the Jordanian diplomatic mission in Budapest earlier this year. Mr. Pharaon is not a professor, so it is a mystery why Mr. Orbán refers to him with this title. This, alone, may have been enough to sink any number of political parties in other countries. Not so in Hungary. 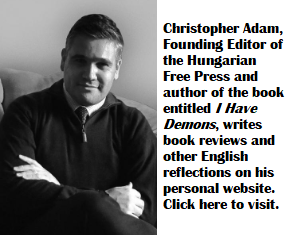 And then add to this the fact that Fidesz failed to reach the minimum threshold in the October 2nd anti-migrant referendum to render the vote valid and binding–a threshold that Fidesz itself had set. Then, having lost the support of the far-right Jobbik party, the government failed to muster the two-thirds majority in parliament necessary to amend the nation’s Fundamental Law, so as to effectively prohibit the “settlement” of foreign nationals in Hungary, without first seeking parliamentary approval. Finally, there has been a constant drip-drip-drip of appalling corruption allegations linked to Antal Rogán, the government’s propaganda minister, in the independent media. Despite weeks of political misery for Fidesz, the Medián polling form–among the most reliable in Hungary–tells us that Fidesz’s popularity has not suffered. Fidesz maintains a steady lead in the polls, registering 36% support. The governing party is followed by Jobbik (10%), the Hungarian Socialist Party (9%), the Democratic Coalition (6%) and Politics Can Be Different at 3%. Both the Együtt (Together) party and the satirical Hungarian Two-Tailed Dog Party stand at 2%, while the openly communist Munkáspárt (Workers’ Party) stands at 1%, its highest level in years. Fully 29% of the population is undecided. Jobbik’s decline in support is turning into a sustained trend–the party lost another 1% in support in the most recent poll and is at its lowest level since January 2014. It would appear that the government’s campaign aimed at painting Jobbik leader Gábor Vona as a treasonous homosexual is working. And Fidesz’s masterful and ruthless control of the bulk of the country’s media is so efficient, that much of the population (especially in rural Hungary) is shielded from damaging news. 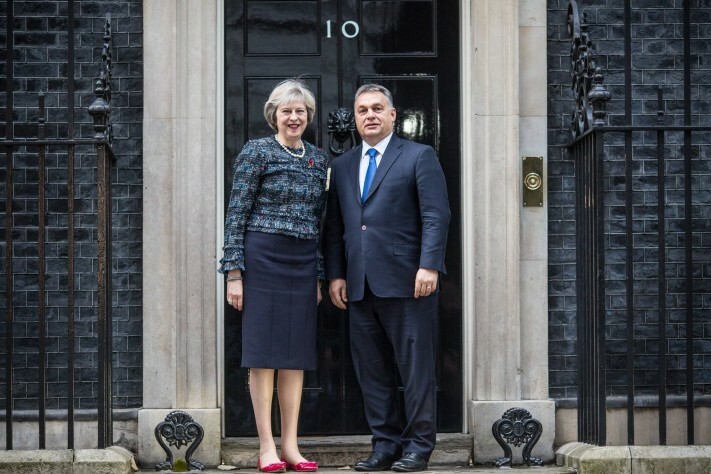 Prime Minister Viktor Orbán meets British Prime Minister Theresa May at 10 Downing Street on November 9th, 2016. Photo: Viktor Orbán’s Facebook page. Liberals should finally wake up and smell the roses. Fascism, authoritarianism, is popular among the working classes, and has had long stretches of success. The language of political deception, used by Trump, and his newly appointed strategic advisor, Steve Bannon, is especially efficient among millenials who derive all their news from their handheld devices, on which, content is often as far from reality as Patagonia from Washington. We live in an age, where emotive political messaging has overtaken rational discourse as the principal tool of political persuasion. This is the new, post-liberal world. Liberals, the followers of the rule of law, justice and constitutionalism better learn to swim, or else they will sink. I’ve been trying to teach them swim, but … They are Hungarians too.